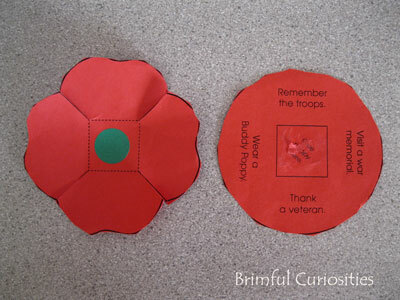 My daughter brought a simple, yet meaningful poppy craft home from school last week. Underneath each one of the poppy's four leaves is an reminder of a way to remember the servicemen and women who gave their lives for our freedom, for our country. I'm not sure where her teacher found the template so I can't give credit where credit is due, but I think that this is one of the best crafts I've seen for Memorial Day. The poppy is easy to make yet it truly captures what today is all about. Even without the written reminders under the leaves, the poppy itself serves as a way to help remember the fallen heroes. 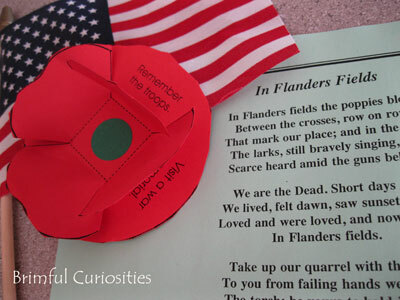 A woman named Moina Michael wrote a poem describing the poppy's significance after reading another poem "In Flanders Fields." She was the first person to make and wear a poppy in honor of those who died while in service to our country. President Barack Obama, in his Memorial Day proclamation, has called for a time of prayer for peace at 11:00 a.m. and asks that we observe a Moment of Remembrance beginning at 3:00 p.m. local time -- two more ways we can remember. How will you remember? What's under your poppy's petals today? We are already out for summer but I would love to know where she found that pattern!! Very nice craft! I had to memorize that poem in school and I still know it, and all I have to do is see any poppy in real life and I start reciting it!